For many businesses, mediation is seen as a swifter and cost-effective alternative to conventional forms of dispute resolution. Although its acceptance by policymakers in Europe has been slow, the recent development by various EU Member States of legal and institutional frameworks for commercial mediation have been complemented by a European framework for cross-border civil and commercial mediation, the EU Directive on Certain Aspects of Mediation in Civil and Commercial Matters. various approaches to mediation style. Participants have been chosen from Austria, Germany, France, England, Scotland, Denmark, Norway, Sweden and Finland, with the aim of including all the dominant European legal traditions. There are numerous case studies, including the role of mediation in such major projects as the Vienna Airport, the Eurotunnel, and the Øresund link bridge. The book contributes to the further professionalism of ADR in Europe by providing accurate information on the functionality of the process and its attainable results. 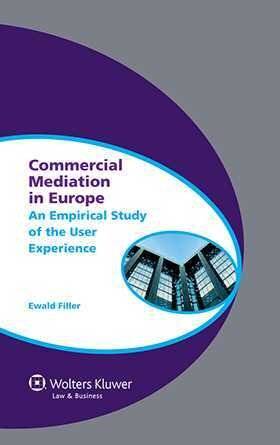 In addition to describing the professional performance of European mediators working in the world of business, the author’s analysis crystallizes the processes, models, and strategies that characterize the practice of commercial mediation in Europe. Chapter 2 Findings of the Pre-Evaluation. Chapter 3 Commercial Mediation in Europe. Chapter 4 Findings, Recommendations, and Perspectives. "The information gathered in the book represents and in-depth insight of the respective mediators and the representatives of business enterprises." "Overall the book contributes to further professionalism of ADR in Europe as constant examples regarding the use of mediation in Europe are brought up. The book is specially designated for practicing mediators, lawmakers and other decision makers." "This book analyzes the procedures, models and strategies used in commercial mediation. It is a very helpful guide for lawyers and their potential clients, mediators, legislators, and other involved institutions, wishing to base their actions on reliable scientific and empirical evidence. " Apostolos Anthimos in Armenopoulos 2013, p. 211.